For an interactive person like me, this situation is pretty sad…. Three weeks of replacement time ends this coming monday, and I must say it was the best learning experience in the shortest time possible…Over a week, I got used to the 14 hours per day routine that I will now miss (unless I get screwed again in the next assignment! :P) for sure. A journey into this year…. He: I am going to Warangal, you? Me: Yes. Warangal, Andhra na? He: Yes yes yes, Aaandhra Pardesh wonly…my birth place. Me (with a smile): Hmmm…nice. He: I know little little Englees…learning only from talking taking. Me: Good…that is how one learns the best. He: What is your name? My name is Madhukar. Me: Sreeram. Nice to meet you. He: Nice nice nice. You in Software-a? Me: Yes. Read the company name on the bag, didn’t you? He: Yes yes yes, a little Englees I can read. Me a Welder, I do welding. He: You travel on bus always, or because of recession? I took my seat on the train…and as it moved away from Chennai, I had lots of time to do a retrospect on the year that went by. So then as the New year is soon approaching, I thought as to well why not see what my resolutions could be…whether I follow it or not! So here are the things that are on the mind…whether thoughts turn into actions or not, the New Year will be the arena to witness! 1) To stop sleeping long hours….say, yell at the alarm and get up at 6am. 5) To dream about becoming an enterprenaur, definitely not in the IT field. Hotel Management may be! 1) To mediate a negotiation between my scalp and the hairs they hold. They need to come to an understanding and stick/stay together/attached. Else I may end up clean! 2) Get out of the current project, mainly cos am bored…its been 15 months already into this. Sheesh! 4) To get back to Bangalore, while staying put at the same job. Being at home would make this jack, a little more happier. And get rid of the useless what-nots! HE CAME, HE SAW, HE was CONQUERED. Let me talk a few words about the one who aspired to be my roommate sans my wish and permission. Sunday, I decided to treat him again. So took the second packet of cake, cut it into two halves and placed them in his two haunts…Today morning, I found the half kept under the kitchen sink all gone…so I went to check his bathroom…and what I saw, made me all sad…he was gone…not from his bathroom, but from our lives. He had passed away, probably due to congestion in his wind pipe…one piece of cake per night was advisable, but our Jerry was a glutton. He was so late to realize that and sadly, Jerry is now “late” forever. I jumped again, ran out all excited to wake up my sleeping roomie. When he blabbered something in his sleep, I just left him there. Left a note for him, asking him to take care of the final rites of our most recent roomie. Though the bessy beach is just 2 kms away from my flat, today I went there after 3 weeks…sad that I needed a reason to go to a place I love to go. 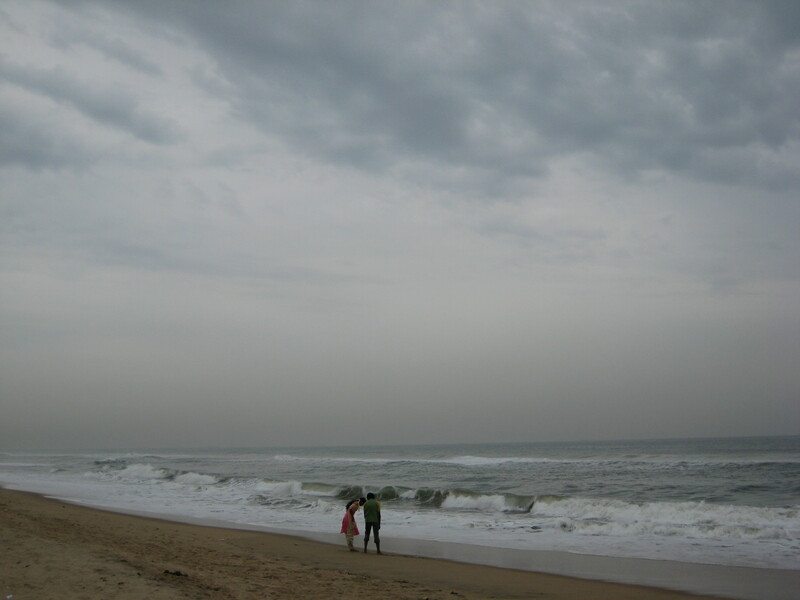 Hmm…anyways, I loved to get half wet in the cold salty water of the lovely ocean…the bay of bengal…. We chatted for a while sitting on the sands as many unknown people approached us now and then…some offering to read our palms and some our faces, some vendors offering to sell us their products and some seeking alms. We heeded to none, as we went on and on…well, there were those moments of silence but lets not hype about that!!! On getting back to Bevdi and Suba, we got into a discussion on movies…especially the scary and horror types…which led to talks on black magic and voodoo dolls…not quite intellectual, but nevertheless. I walked Didi down to her house, main reason being the books she had asked for, which I had kept in my Activa parked near her place. After a quick bye, I joined the other 3 for dinner at this place called “Family Restaurant”…it was our first visit to that place, and definitely our last. The place stinks…big time. It was stinking outside (some drainage leak) where we sat, but it was stinking even more in the AC inside. Sheesh.! And the service, was pathetic…the mineral water we had asked for came right at the end of the course, that we were kinda unsure if it was to drink or for hand wash! Food, well…was nothing great!